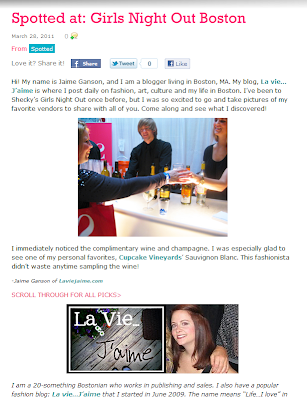 Shecky's asked me to cover their Boston Girl's Night Out event for their "Spotted at" series. I was so excited to find some cool vendors... go check out the post here. Thanks again to Shecky's for this opportunity! How fun! NIce job, girl! well sounds like a nice way to spend your day! oh wow congrats. u're super lucky. Looks like it was a great time! i'll have to go to a Shecky's event in Chicago next time. Oh, CONGRATS...you look awesome in that picture. HAPPY DAYS Jaime...have a good evening. I remember when I would go the LA Sheckys. How fun! I am going to the one in DC tomorrow and your article is making me even more excited!